How often have you heard an NFL head coach mention that his team needs to “limit the turnovers” and “protect the ball” to be successful in their upcoming game? Quite often, I bet. 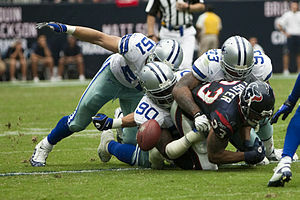 In the 2012 season, there were 123 occasions when a team played a game without committing a turnover. In those games, teams were 98-24-1, an .801 winning percentage. Three teams led the league with most games with no turnovers: Atlanta, Houston and San Francisco each played seven games with no turnovers. Oakland was the only team in 2012 that did not win a game when they had zero turnovers. They were 0-1. If we expand the parameters a little and look at how well teams have played in turnover-less games since the start of the century, we discover that NFL teams were 1025-291-1 in games with no turnovers dating back to the start of the 2000 season. The Patriots top the list with 68 games played with no turnovers, while the Indianapolis Colts have the league’s best record in these games, going 39-2 (.951 winning percentage) in those games. Following is a look at each teams’ record in games with no turnovers (from 2000-2012). Note: The Atlanta Falcons had the longest current winning streak in games where they did not commit a turnover. The Falcons had won their last 19 straight turnover-less games, dating back to Sept. 28, 2008. They then were defeated 22-17 by Tampa Bay in a turnover-less game on December 30, 2012, thus ending their streak at 19. The Baltimore Ravens have the longest current winning streak of turnover-less games with 12.